We are a leading Computerised Brinell Hardness Testing Machine Manufacturer and Supplier based in India. 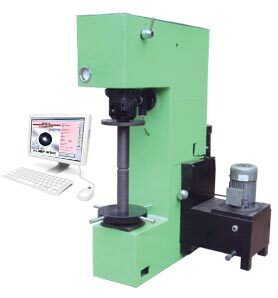 The Computerised Brinell Hardness Testing Machine provided by us is made from high grade material using technologically advanced equipment and machinery. Our Computerised Brinell Hardness Testing Machine is available with 14x magnification in front for projecting dia of ball impression on glass screen with 0.01mm accurate micrometer measuring system. Avoiding additional time for ball measurement, the indentor rotates and projects dia of ball impression after unloading operation. This process ensures real rockwell number on Computerised Brinell Hardness Testing Machine. Also, our system includes calibration and check facilities for calibrating systems and to check calibration. This process eliminates chances of occurring system error in measurement. PC or LAPTOP and windows XP operating systems are to be procured by customer.